Will Bloom has daddy issues. Specifically, his dad Edward has a history of dramatizing his whole life to the extreme. Not only does this leave Will feeling irrelevant to his father’s “big” life, but like he doesn’t know the man at all. Once Will is on the verge of becoming a father himself, he and his wife Josephine are called in to visit a sickly Edward. Edward, true to form, takes this opportunity to relay his life’s story to Josephine, along with the audience. It’s a tall tale if ever there were one. ‘Big Fish’ is a story about stories and storytellers, and that lends itself to a lot of ideas that can be touched upon; why do we tell stories? Just how bad is it when a story overtakes true events, or is it even a bad thing at all? The thrust of the drama is Will’s belief that just because his father decorates his life’s story with garnish, that he’s not being himself. He’s conflating a storyteller with a liar, something that I think a lot of people do subconsciously even if it’s not to Will’s level, especially in regards to moviemaking. As time goes on and special effects make it easier to bring the fantastical to the screen, people (myself included) are more quick to place fiction in a box labeled “inconsequential”. The more elements of fantasy present in a work, the more likely we are to dismiss it as having nothing to say about the real world or real people, when this couldn’t be further from the truth. With that said, this movie does take advantage of its place in fantasy for the sake of poking fun at its own philosophy of flavor over facts. Early in the movie, Edward recalls being shown by a witch how exactly it is that he’s going to die, and throughout the rest of his life he circumvents all sorts of dangers simply because dying that way isn’t what he saw. The world around him makes exceptions for him because just getting killed by a sentient forest isn’t satisfying enough an ending for his story. Moments like this are unapologetically silly, and that’s definitely to the film’s advantage rather than detriment. It isn’t just Edward Bloom who has a story to tell. The cast of characters present throughout his tale all have their own, even if most are glanced over or told in different methods. They could be a giant with a sob story, a poet with a bad habit of leaving his writings unfinished, or a boastful Ringmaster with an unbelievable secret. What with his stories being admittedly nonsensical, tonally strange, and featuring the same people in different “roles”, I can’t help but wonder how much Edward Bloom’s style of storytelling is meant to mirror Burton’s own. With this in mind, it’s hard not to read the movie as a justification of Burton’s signature tropes; Burton’s own stories are odd, creepy, hokey, and often contrived, but they’re also (usually) endearing and entertaining for those very reasons. They operate more on emotional desires than any kind of logic, and a film like this one would have you consider that that kind of thing has just as much merit as a plot that makes sense would. Edward Bloom certainly manages to sell himself as a sort of “ultimate folk hero”. I won’t be the first person to compare his character to that of Forrest Gump, simply due to the scale of his adventures and influence. Both Albert Finney and Ewen McGregor bring a natural charm to the old and young versions of the man. McGregor in particular plays both it serious and goofy whenever necessary. William, in contrast to his father, is more inclined toward facts, something subtly reinforced by his position as a news reporter. Will is never portrayed as unsympathetic at all, which goes a long way in keeping the “Edward as proxy for Burton” angle from feeling bitter or pretentious. Will’s character growth comes not from just up and accepting the fantastical as better than cold hard reality, but from learning to see the value in both. One of the lines late in the film talks about the annoyance of people talking to those who can’t hear them, and yet refusing to truly hear his father is Will’s entire problem. It’s a really interesting character, and Billy Crudup’s performance toward the end gets me every time. The supporting cast of Jessica Lange, Alison Lohman, Marion Cotillard, Matthew McGrory, Danny DeVito, Steve Buscemi and Helena Bonham Carter all seem to be on the same wavelength, and if the film is helped by anything it’s that everyone in the cast (with one exception) is just a likable presence. They all add to the idea that no matter how strange the story gets, it’s almost all in good fun. 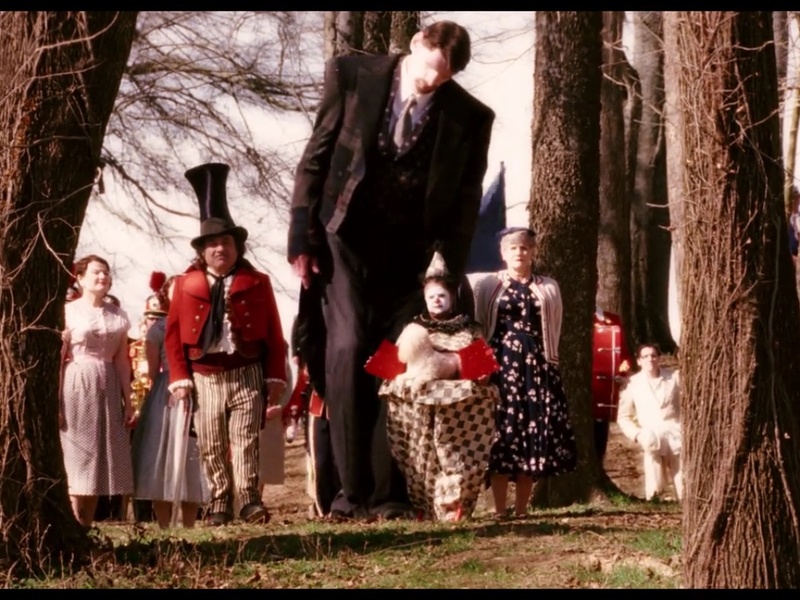 If you’ve ever wondered why every Tim Burton movie seems so devoid of color, ts because he injected every ounce of it into this movie. This is definitely a big plus, as the worst thing about Burton’s other less saturated films is that such a monotonous aesthetic makes it easy to gloss over Burton’s more interesting visual quirks. Because the coloring, costumes and sets of ‘Big Fish’ are more accessible, things like dynamic shirt composition and interesting use of effects are more noticeable. The whole movie has a warm, friendly atmosphere to it, even in the present-set scenes, and that goes a long way. Burton is once again working with his go-to composer Danny Elfman, and though I adore most of Elfman’s film scores this one in particular damn near drives me to tears. It’s got a consistently “Southern-ish” vibe to it, at least, when it isn’t being diegetic. It’s eerie, whimsical, etc all when it needs to be. I’m not exactly sure how well it works when separated from the visuals, but that can hardly be classified as a complaint. 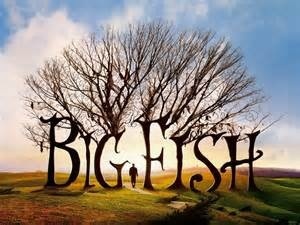 ‘Big Fish’ is, in my opinion, one of Burton’s best. This is a little unfortunate, as I think of it as his last movie to date that I can really say I’ve loved. It’s a touch act to follow for everything he’s been involved with since, and the worst part is I feel like he’s been deliberately distancing himself from the things that make this one work. 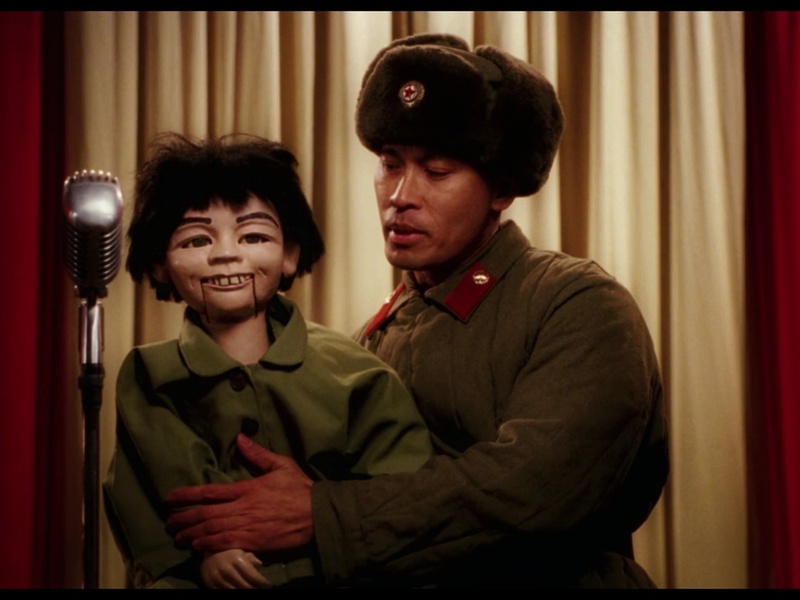 It’s not a movie I see get talked about much, and I really think it deserves a bit more recognition. Posted on May 28, 2015, in Movie Reviews, Other Movies and tagged Tim Burton. Bookmark the permalink. Leave a comment.